Well, it’s been so blasted busy it’s crazy. We pick up to 15 pounds or more a day in strawberries and I must say I have no idea how they make money at it considering even if we sold it for organic prices, we still wouldn’t make minimum wage. Arlis’s sister and mother picked one day, and we gave one day’s worth to other family members. Maia (Marcus’s friend) is coming one day (only she better hurry-wink wink) because they are starting to die down. We may have harvested 10 pounds yesterday, and the harvest is getting to where we could skip a day if we wanted to. Ever been blessed more than you could handle? The potatoes are blooming, so not long b4 harvest there. The lower field got washed out, the only thing salvaged are the potatoes and a few beans that we kept poking back down in after every rain. Suffice to say we will have to make severe changes and find a different place to put that field next year. Too bad Arlis has already progressed as much as he has on the fencing. All hens are hens now (in other words, layers). We have 6 eggs this morning where we got 2 today and yesterday and such, and so Arlis put them in the nest hoping one will take. I’ll give them today, maybe tomorrow before we give up and eat them. The ducks’ days are numbered as even Arlis has had enough with them emptying the water container constantly. I have been shoveling manure out from behind the run area. There is a building there where they kept a steer or something, and a perfect square of what looks and acts like peat moss but is chicken poo underneath. I have been shoveling it into the manure pile and once it’s done, I’ll move onto the shelter. It is filled will poo that will be much more difficult to move. The “peat moss” is like loose dirt and easy to move. I believe it is where a chicken coop once was years ago This are will eventually become an addition to the run more than doubling their play area.. In mowing, I have raked the grass and placed it with the already accumulated (and depleted) pile. It looks and smells like hay as opposed to what I raked from before. I, obviously, didn’t get it all raked, but will continue as I can. Merlin has started nesting, and therefore may need to be called Merleena or Marilyn…any suggestions? I fell up the steps two days ago and am still slow because of it. I think I actually chipped the joint in my right big toe, so squatting is uncomfortable, but necessary in weeding and picking. Here is where the vinyl siding went up yesterday and continuing today. 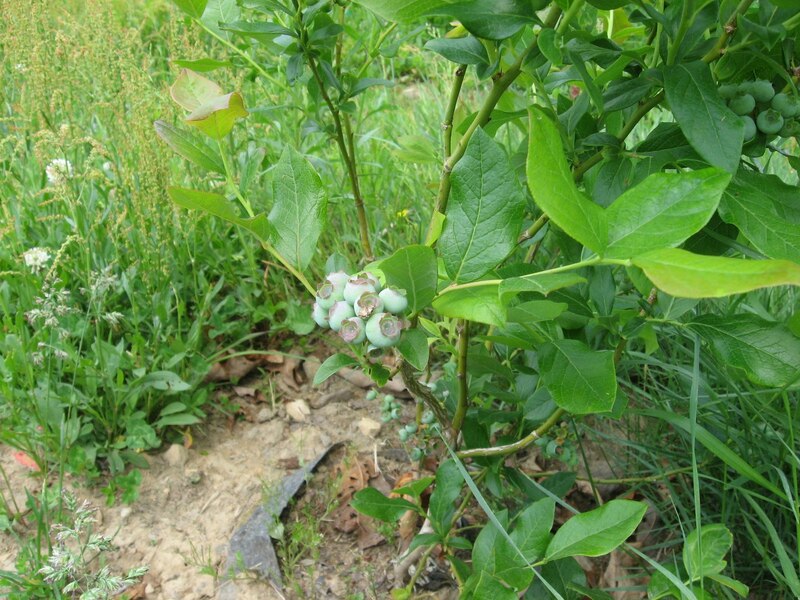 Arlis’s blueberry bush has unripe berries, and we found a HUGE wild blackberry area. Here is a picture of the blueberries. We have European wasps and Mexican hornets. 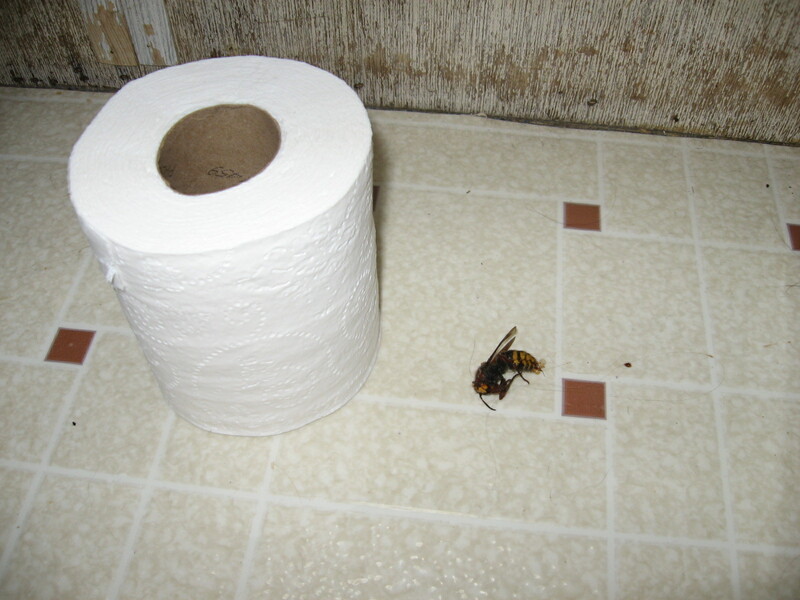 Mexican hornets are actually called cicada killers. Neither are aggressive, and in fact, only the female of the European species has a stinger. I don’t care, they’re big, scary, and have more legs than my dog, so I’m killing them. Note their size below. That’s a new roll there. The carpenter ants formed another satellite colony in our wall after ridding the last one. 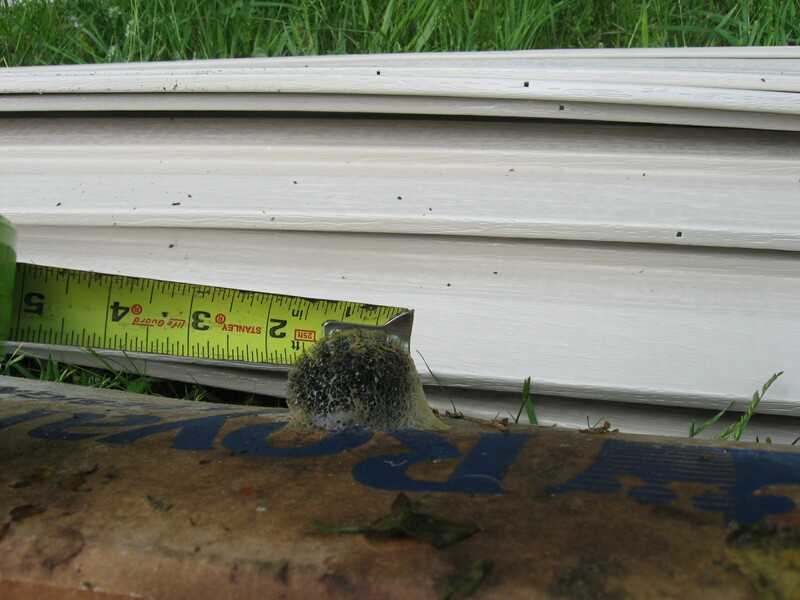 They also had one in the new box of siding. I have sprayed to where I can still taste and smell the toxins. We have put a major damper on their lives and I no longer hear them in the wall. 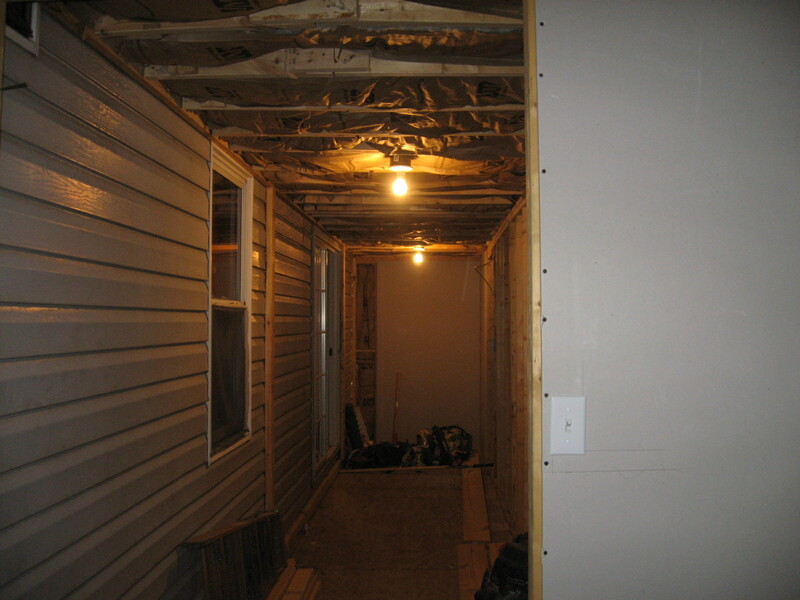 We haven’t pulled back the paneling yet, but will soon I hope. It’s horrible to lie in bed and hear the scurrying above your head behind the wall at night. They’re active at night only really. The potatoes have potato beetle, and I used a jar of gas and two smashing rocks. The upper field of corn appeared OK, and the beans, and I even had two watermelons. We seriously need to work on finding a field because I am SO planting water melon next year. I can hand pollinate one plant if that’s all that makes it by golly, I want my watermelon. 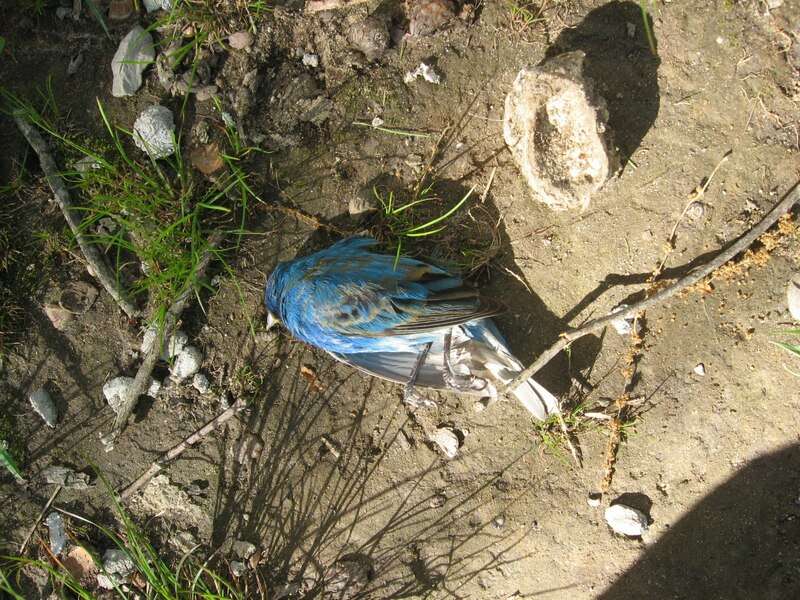 I have also attached a pic of a bluebird that just dropped dead with no reason. It wasn’t there, and hour later it was. I was disturbed, the bird showed no signs of death except the eyes were already sunken/eaten, so I fear a disease. But nothing yet has happened, so I hope and pray all is OK. I’m using today for pc work-this e-mail, bank statements and such…. AND SOMEONE PLEASE EXPLAIN THIS!!!! I FINALLY got all the vids uploaded. Took ALL day! But, I will say some are very cute. Here Merlin is at one week old. Adorable and putty in your hands. Looking back, I can see his personality amidst it all. Let them both in the tub. What a poopie mess! But it was fun for all. Just to show you what it was like when they were out for their daily exercise. They follow you EVERYWHERE!! You walk somewhere and you hear “flap flap flap flap flap” of their feet on the linoleum behind you. You step and trip over them all the time. But they were cute. Just trying to show you the sounds and such of the chickens This is only maybe half their run. We’ll get the rest opened up to them once other priorities are taken care of. Funny though, while filming them, George starting making a noise and getting all weird. Then the girl next to him did. They looked possessed. It was quite amusing, and even funnier in the vid than in real life. I finally got video of the little ducks in the water. Cute. Merlin is the one with more adult feathers, and Cooper is fluffier. And finally a small video of the ducks jumping into the coop. We were in the process of building them a ramp, stairs when they up and did this. Hmmm, guess we don’t need to after all. Not much to see, but some of you may be bored 🙂 . Funny, the ducks won’t have a blasted thing to do with us now, and I have to catch Merlin to hold/pet him. I try to work with them every day to make them less afraid of me. The rain really put a damper on things. It made the garden grow, but it also made the weeds rampant. 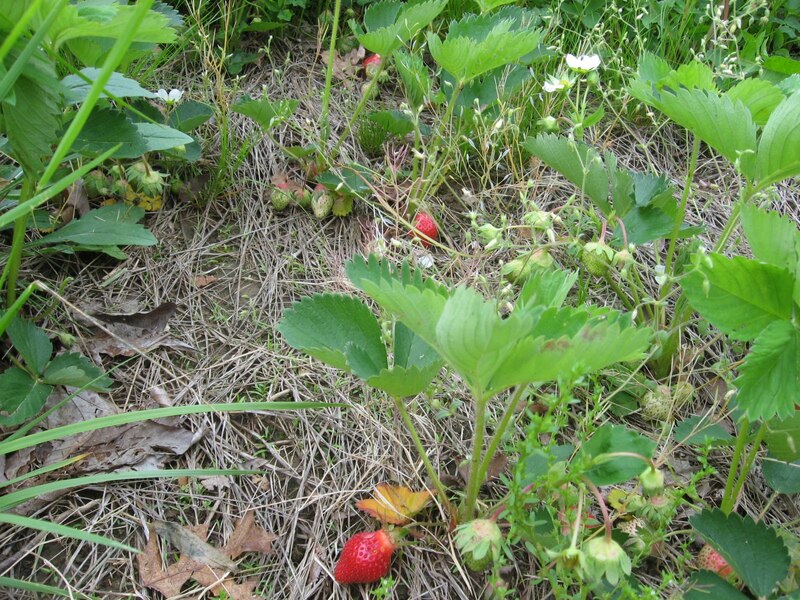 We were walking around yesterday and “ooo strawberries!” I ran for a bag and a camera and we each got one. We’re waiting for the rest to ripen fully. 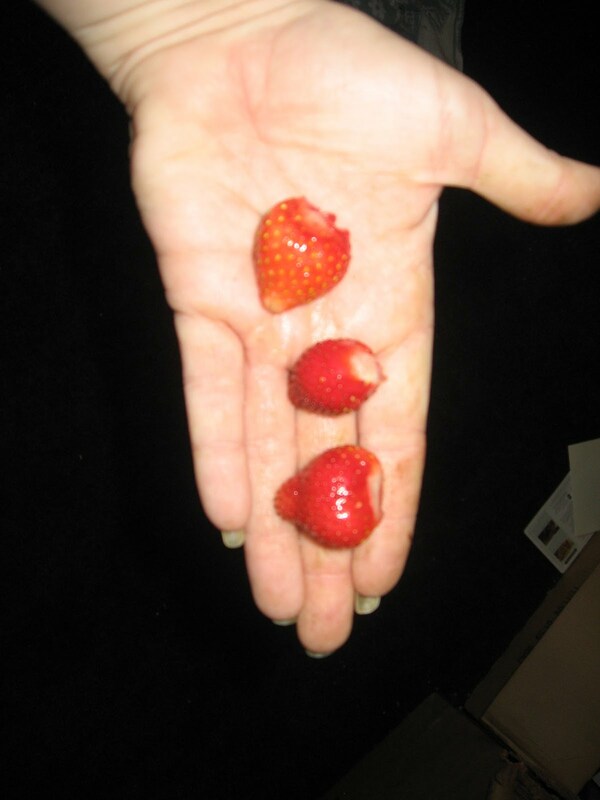 I never liked strawberries. They were too tart. By the time you put enough sugar on them to make them edible, you might as well just go buy a Little Debby. That being said, these were MARVELOUS. They were gushy and juicy and sweet. 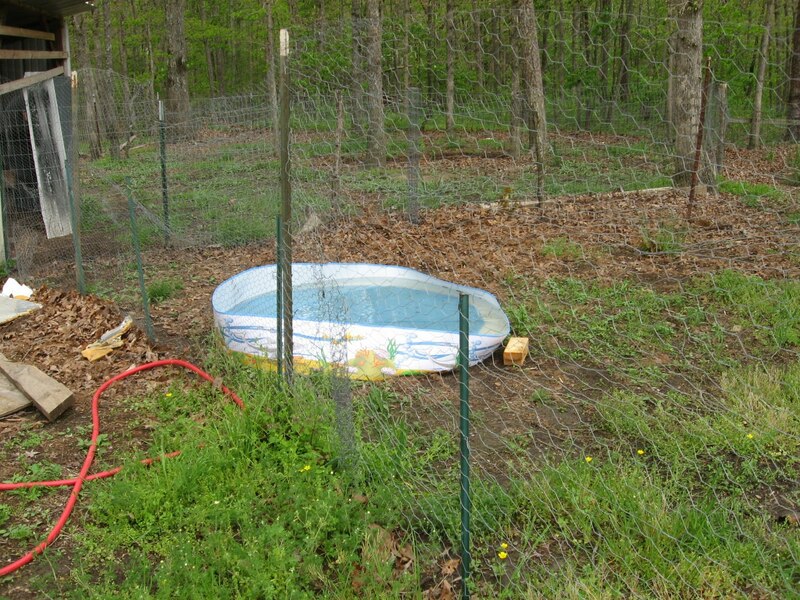 The ducks are now with the chickens and making a mess even with the waterer as high as it is. They go out and swim in their pool. I enjoyed watching them so much, I have no pictures really, and no video yet, but I plan to get some. We built a box for the hen to lay in. She still insists on her one spot, so we may just let her do it there and try to come up with a way to let the chicks feed separately, though presently, I have no idea how. 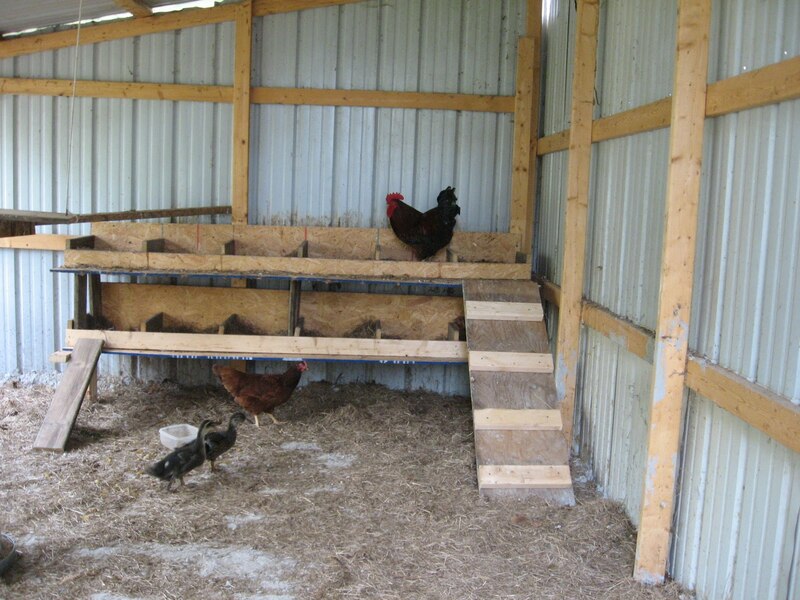 The picture will show her, she’s the white one under the ramp. You can just see her head poking out from the left of the ramp on the bottom row of nesting boxes if you look hard enough. That’s her nesting spot. Oh! I found a 4-leaf clover patch while weeding the strawberries and pressed them in a book. One was 2-3 inches across, but the wind took it. 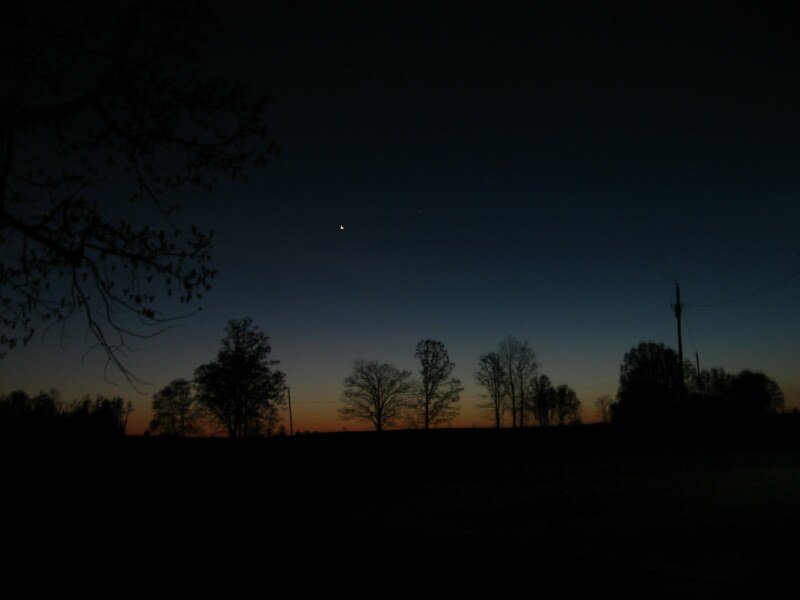 Marcus wanted me to take a picture of a star. Knowing good and well it wouldn’t do well, I put it on night mode and did it anyway. It had surprising results. The rain allowed us to find leaks. We are grateful for this in a way. The stove pipe was expected as that will leak until the other half of the roof is replaced. 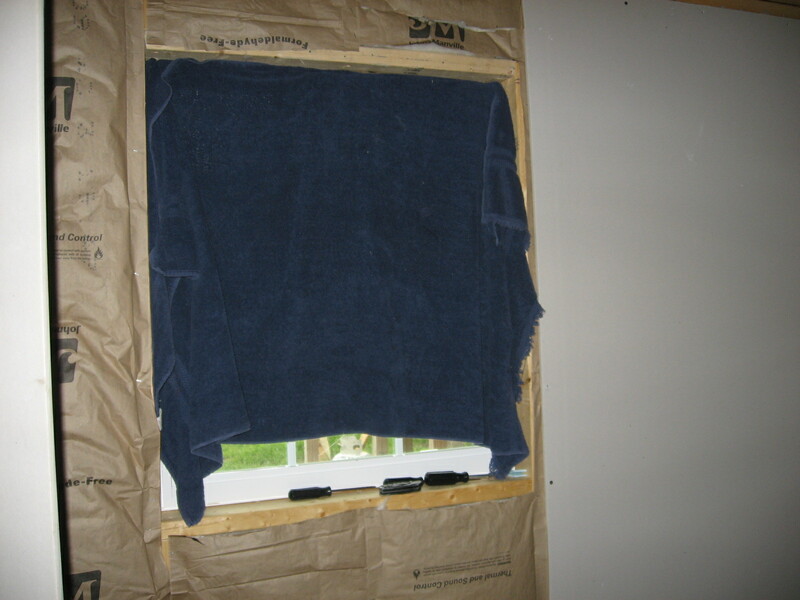 A window leaked, so we know to use more caulking, and with siding that will help too. The hole that hasn’t been closed in yet leaks, but that’s expected (I told him so). Here are updated pictures of the inside. It has electricity. 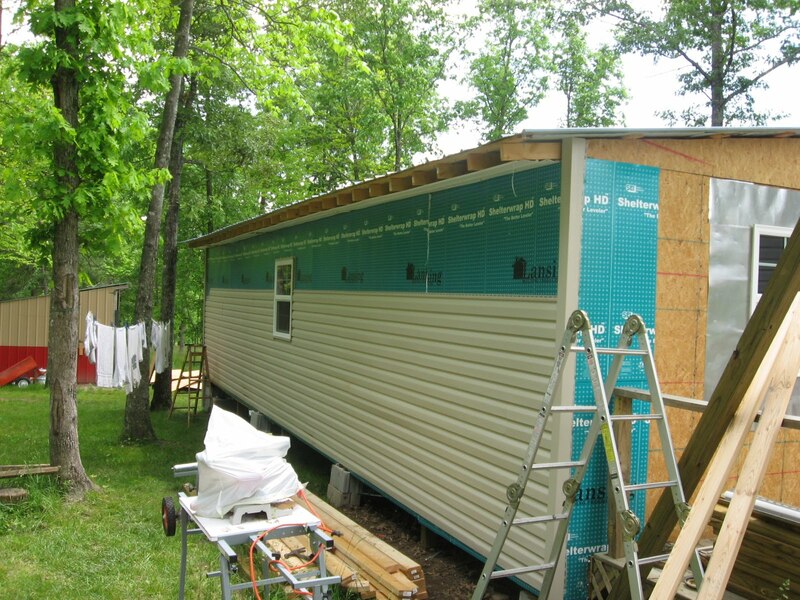 We hope to have siding and fixed holes in a couple of weeks. 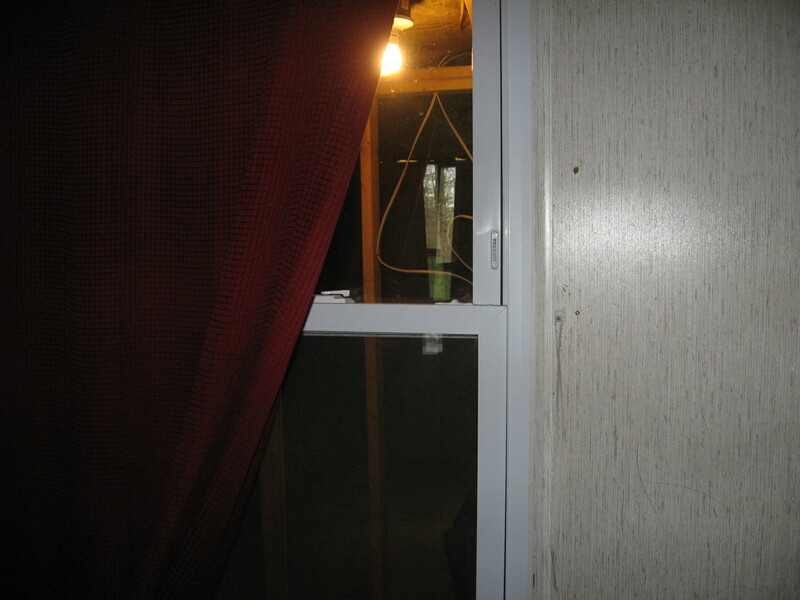 The living room window opens up to the hallway, and the towel shows the one that leaked. At least now there’s some type of privacy/place to put things, etc. We have been able to get more from the shed and such so things are going better.